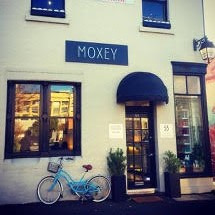 As a first time client at Colin Moxley, I was thoroughly impressed with my entire experience from the moment I walked in the door. All the staff were friendly and professional and the service I received from Colin and Richard was brilliant - I am delighted with my new hair (both cut and colour) and will definitely be returning to their beautiful salon for my next hair treatment. Thank you for such a lovely experience! Thank you so much Kirstn, it was an absolute pleasure looking after you. Hope to see you again!